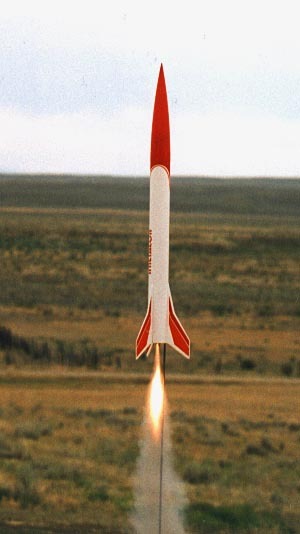 This is the second Aerotech rocket I built. I bought the Initiator starter kit (comes with the Mantis launch pad and controller) which is a nice deal. Like all Aerotech kits it comes in a box, and has molded plastic fins with through-the-wall (and to the motor mount) fin mounting. I find Aerotech kits quick and easy to build, and there were no factory problems with the kit. I used CA throughout as per the instructions. I left out the thrust ring. The only problem with this kit is the swept-back fins, which are prone to breaking on landing. I highly recommend this kit, and if you are just getting into medium-to-high powered rocketry, I recommend the Intiator starter kit with reloadable motors (reloadables are cheaper per flight, if you don't lose the casings). Don't rely on the motor clip alone for motor retention if you do use reloadable motors, use another method in addition. 1) 6/17/97 F37-6W CATO. Went up about 20 feet and the nozzle blew out. It landed on and broke a fin. The propellant stopped burning when the nozzle blew out, and the delay never lit. Fin repaired. 2) 7/10/97 F25-6W Nice flight, drifted pretty far because of the wind. 3) 7/12/97 F22-5J Nice flight, too long of a delay. Ejected motor casing and cooling mesh, slight zipper from deceleration. New 29/40-120 casing not recovered. Update: found by neighbor kid 8/9/97!!! 4) 7/28/97 E23-5T Nice flight, broke the repaired fin in half again on landing. Repaired. 5) 7/31/97 E23-5T Broke the repaired fin in half again on landing. Repaired again (with epoxy instead of CA). 6) 8/04/97 E18-4W Nice flight. 7) 8/04/97 E18-4W Another nice flight. 8) 8/04/97 F39-6T Another nice flight. 9) 8/04/97 F40-7W Another nice flight. Broke another fin in half on landing, same place as the other fin broke. Repaired. 10) 8/07/97 E23-5T Another nice flight. 11) 8/31/97 F39-6T Straight up flight. 12) 9/29/97 E16-4W Broke a repaired fin in half again on landing. Repaired. 13) 3/26/98 F39-6T Nice flight. Broke both repaired fins in half (again) on landing. Repaired again. 14) 4/16/98 G33-5J Nice flight. Broke one repaired fin (again) on landing. Tore the entire fin out and replaced it with a new one (not easy to do). 15) 4/22/98 F62-6T Nice flight. 16) 4/23/98 F39-6T Nice flight. 17) 5/07/98 F40-7W Nice flight, delay a little long. 18) 5/25/98 F40-7W Nice flight, rebroke a fin on landing. Wrecked it trying to get the fin out to repair it. Areotech Initiator before its first flight. Areotech Initiator taking off on a F25-6W. 7/10/97. Areotech Initiator taking off on a E18-4W. 8/04/97.